We have the best of intentions on timeliness. We want to be on time. We don’t want to wait. But even in the best of cases, we slip up over and over again. 1. Set all your clocks using a standard, such as your phone, the radio or the television. With all the same time, there is no question about what time you are leaving your home or office. 2. Know how long it takes to travel to your destination, and then add on 15 minutes. We all acknowledge Murphy’s Law, that things tend to go wrong in the best of cases. Adding a little buffer time in makes it easier to be on time. Traffic and weather are not in our control, so make a plan that gives way to potential situations. 3. Establish a routine for self care includes sufficient time to dress, shower and get out of the house. If it really takes an hour to get ready, be sure to give yourself an hour to get ready. 4. Be mindful of where you time lapses occur. These are the tasks that make you late, like drying your hair, picking out your clothes, not having gas in the car. Awareness of where the obstacles are makes for big change. 5. Set a boundary for last minute tasks just before leaving. You probably can’t take that last phone call, read that last email or do that one last thing. 6. Be prepared if you are early. Have a fun magazine in the car you never get to read. Make a list of phone calls to do if you are early. I use that time to confirm appointments. 7. Give yourself space if you are not on time. Call your person and tell them you will be late so they can use the time wisely too. 8. Have a mindset of preparation for a busy day. Set your clothes out the night before, get your bag packed and by the door, and have your phone charging to you are read to go. Check your calendar the night before to know your schedule for the day. 9. Use an alarm to give you a 15 minute warning before leaving. Our kids to better when we give them a 15 minute warning and using this strategy for ourselves makes life easier too. If others make you late, give them a 15 minute warning. 10. Getting to be timely takes time and practice. Give yourself the gift of being good to yourself if you have a few “oops” days. Get back on track right away and make a mental note of where things went off track. 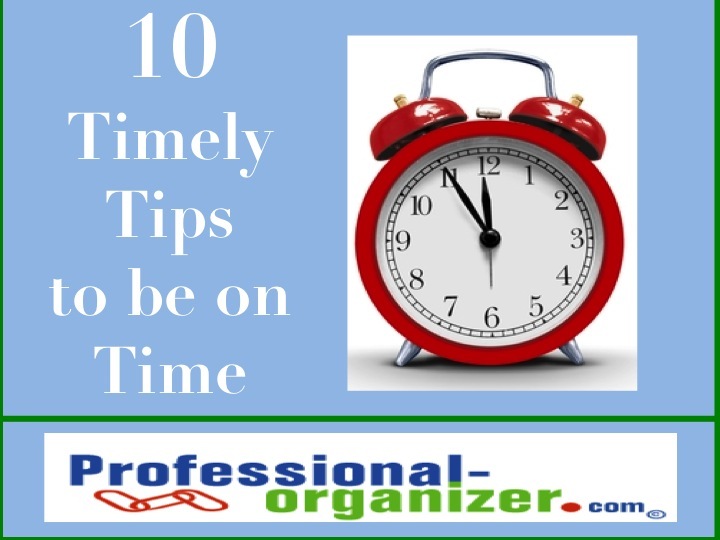 What are your tricks to be on time? It takes being aware of the challenges of timeliness each day to be sure you are on time. After the summer heat, we are all looking forward to transitioning to cooler weather and fall gatherings in our homes. Make a difference in your home this fall! On August 30, from 1- 2:30 pm, Join Certified Professional Organizer and Family Manager Coach Ellen Delap for Transition Into Fall: Easy Eliminating and Closet Consolidating. Learn easy ways to eliminate clutter, consolidate for storage and stay organized in your home. Ellen will share tips on making the most of your time spent decluttering and organizing. Also join Author, Speaker, and Interior Decorator, Leslie Sarmiento, owner of Decorating Den Interiors, for Transition Into Fall: Ease Out of Your Decorating Comfort Zone. She will be presenting the elements of the Transitional Style of Decorating and the 5 simple steps you can take to create a fresh, new look for Fall. 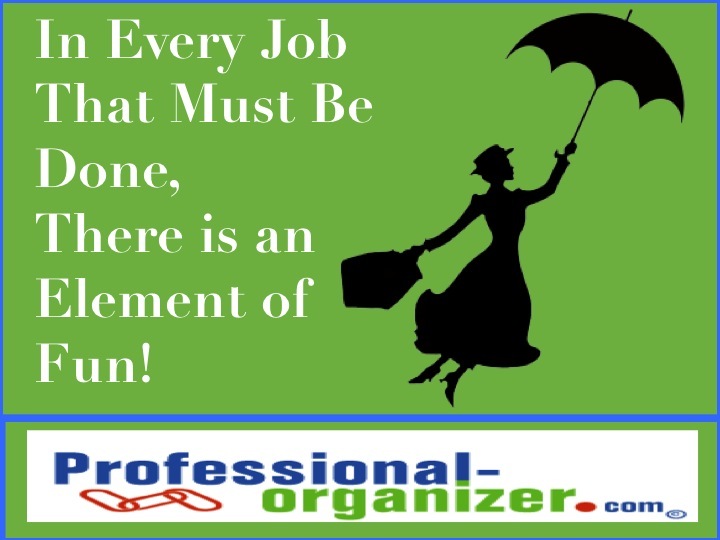 Learn more about Ellen at www.professional-organizer.com or on Facebook at EllenDelapProfessionalOrganizer. Learn more about Leslie at www.LeslieSarmiento.com or on Facebook at www.Facebook.com/DesignIdeas. Ready to make a big break in decluttering? Not sure where to start? Sometimes it is best to start with the easy eliminations to make a quick visual and emotional difference. Choose a few that are really easy for you! 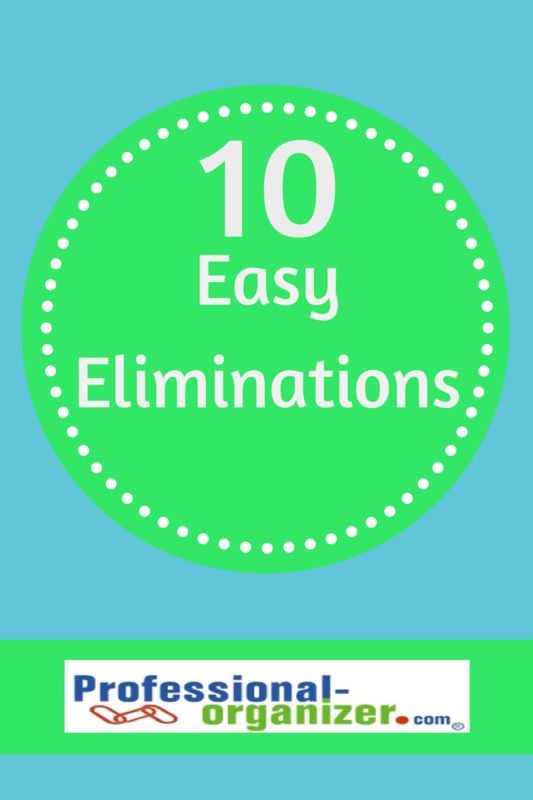 Here are 10 easy eliminations for your home or office. I find that families keep toy boxes, shirt boxes, shoe boxes and boxes galore! Now that boxes are free at the post office for shipping, keep only a small number of different size boxes for mailing. If you think you may return a product, keep the box only until you have confirmed your decision. Only keep 2 of those shoes boxes for upcoming school projects please! Each race we run, vacation bible school we attend, and school alumni celebration adds to our tee shirt collection. It is time to pare down to a number that can fit in a drawer or hang in a section of your closet. What number depends on you. A memory quilt is a good next step if you are not ready to part with these. We all have our favorite! Pull a few together, hang them in an easy access space, and part with the remainder. Some of the least useful are often the most space hogging items! If you have more than one miscellaneous kitchen drawer, go through and pare down to one drawer. In the newly empty drawer you can fit hand towels or pot holders. When was the last time you used that breadmaker, fondue pot, or air popcorn popper? 5. Toys that your kids have outgrown. Our kids are blessed with an abundance of toys. Keep a few that you consider to be keepsakes. Ask you kids to be a part of the decision making process. Donate to local philanthropies to make a difference. Who doesn’t want to have a wonderful home cooked dinner on the table? But having more cookbooks than needed does not make you a better mom or an Iron Chef. Pare down to what you really love and use. Think about using allrecipes.com or the internet to find recipes too. You get new towels, but the old ones are put in the back of the closet or in the garage. Keep a few for those big spills, a few for padding, and move the rest on! Cellphones for Soldiers takes your old cell phone and turns it into a phone card for our service people. It is free to send it off too! As soon as you get your new phone, send the old one packing. Stand over the recycle bin, just inside the garage before you enter the house, and drop in the junk mail. Right away you feel better! We are overwhelmed when the mail comes, so just have this baby step as the first step to getting in gear with paper. More than ever, the clerk asks if you want your receipt. Answer no if it is at Starbucks, at the gas station if you don’t keep a mileage record, at locations with small purchases, and where you think a return is not necessary. Having fewer receipts keeps them from piling up! What are the easiest eliminations for you? Join my newsletter and never miss a minute of organizing or productivity tips! Even the smallest tweak and tip with technology can make a difference. Need to create your grocery list or other list by store? Try the app ziplist for your smart phone. It helps you create a checklist by store. Use click ‘n ship at www.usps.com. Get postage online and print it on your computer! All you have to do is drop it off! Getting lost? Print out your map from google and keep it on the car seat next to you. Use Evernote www.evernote.com or Dropbox www.dropbox.com to keep up with your ideas and notes. Love to try new recipes or looking for old favorites? Try www.allrecipes.com. Keep all your important phone numbers in your phone for easy dialing. What is your favorite technology tweak? I am honored to post again on D. Allison Lee’s blog, Organize to Revitalize. If you have just started your new business, getting organized is vital to long term success! Check out this post to learn the critical organizing success factors! In every job there must be done, there is an element of fun! Just a quick quote from Mary Poppins, but it is so true! What if you knew that getting organized would be fun? You find the fun and …. (you finish the quote here!). Write a letter to your stuff, about breaking up with it. Gather up your goodies and host a swap with friends, especially for kids clothes. So just how do you make organizing fun? https://professional-organizer.com/WordPress/wp-content/uploads/2016/07/logo.png 0 0 Ellen https://professional-organizer.com/WordPress/wp-content/uploads/2016/07/logo.png Ellen2011-07-05 21:55:582014-06-18 18:32:31In every job there must be done, there is an element of fun! How do you disconnect, get “off the grid”, or take a “digital sabbatical’? For me, it is a day I decide that I need some time away. I want to be in the moment with the people I am connecting too, not thinking about all the responsibilities of work. It can start very small with a few hours between checking email and your phone. Just begin with a routine of checking email 3 times a day. The same can happen with your phone. While we do use our cell phone for our family connections too, you can choose to return phone calls at 5 pm for a day. It can grow to be one day every week, like Sunday. You can plan on a nap, plan some family fun, and plan some rejuvenation time. And it can be a leap! You can take a week for a vacation or a stay-cation. Using technology for information about your destination and your travel, you can restrict your technology connection. So how does it start? With your commitment to being in the moment, taking time to take a break and taking time to do all those things you love. How are you putting into practice a little R&R away from technology this summer? It is realistic? Do you want to? I would love to know how you make the break or make the connections while away. https://professional-organizer.com/WordPress/wp-content/uploads/2016/07/logo.png 0 0 Ellen https://professional-organizer.com/WordPress/wp-content/uploads/2016/07/logo.png Ellen2011-07-04 07:04:502011-07-04 07:04:50Putting into practice Getting "Off the Grid"